23. Location: California, USAWhy we love it: The built-in joinery here has been designed to make use of every bit of available space, even taking in the area around and above the window. Add in storage cubbies for all the owner’s laundry essentials, and we’re starting to feel organised just looking at this space. Smaller indoor line and iron board - could this fit into the existing space? 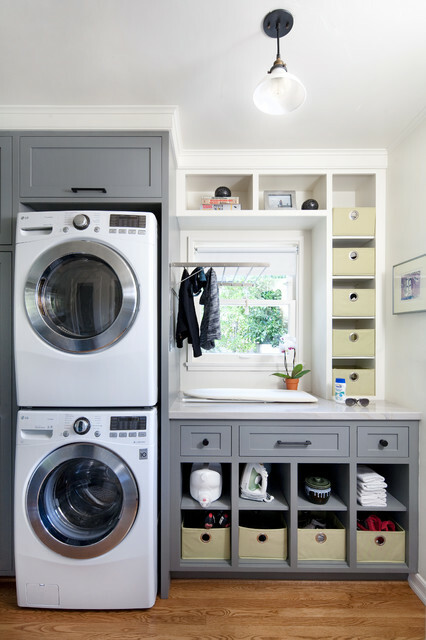 If a small space becomes available between W & D, or near them, I thought a small cubby like this was an intriguing idea for storing a large detergent container.